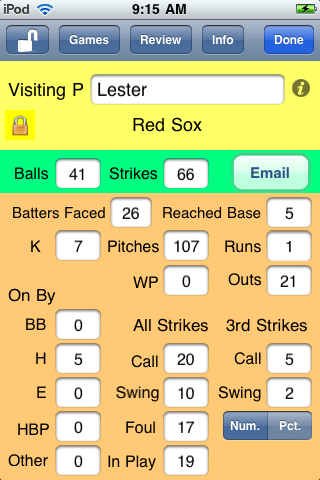 A new version of OnScreen Pitch Count, the most complete, easy-to-use app for recording baseball pitch results on the iPhone and iPod Touch, is now available. Getting OnScreen Pitch Count to the point where it did its main job well and reliably in a way that was quickly learned was my top priority, and I think I was successful in that right from the first release. With time I’ve been able to add features such as emailing results, including attachments that can be imported into spreadsheets. This new update is more in the nature of a polishing than one that introduces big changes. I’ll just use a few screen shots as the quickest way to point out the differences from earlier versions. I recommend downloading the new User Guide for more complete details. An obvious difference to anyone that’s used the app before is the presence of a toolbar at the top of the different screens of the app. The main screen in which pitch data is entered is shown below. The four toolbar buttons with titles, none of which are used for recording pitch results, were formerly elsewhere on the screen and just do what they always have. The totally new control is the one with the opened lock icon on the left of the bar. A bit below it, in the top yellow region, is a closed lock, which indicates that the screen is locked, its normal condition. As one might expect, tapping the button unlocks the screen and changes the icon indicating the lock state to show an open lock. So what does unlocking do? Two things really. First, it makes it possible to edit the pitcher’s name. Previously, once the name had been entered and saved it couldn’t be changed. Obviously, there are times you might want to change the name, including of course when you’ve misspelled the name for some reason, but also when you’ve only learned the pitcher’s name sometime after the game started, or even after it ended. Unlocking allows you to change the pitcher’s name both during the course of the game or later when you’re reviewing it. The other thing unlocking does is to make it possible to terminate an inning before three outs have been recorded. This is something that comes up in leagues with limits on runs scored or total batters in an inning. Having coached in a minor Little League that only allowed a team to bat once through its complete order in an inning, I should have thought of this myself, but I had it pointed out to me by a user who coaches a Little League team in Texas. Thanks, Daren. Unless the screen is unlocked with the toolbar button, the New Inning and Switch Sides buttons are disabled (as shown) until the third out of the inning has been recorded, in keeping with my philosophy of preventing accidental taps that can mess up pitch recording. But this was a clear case where an override was needed. The screen below is one where the pitching results from a game are being reviewed after the game has finished. The toolbar is a bit different from the one already considered. The unlock button allows the editing of the pitcher’s name as before. The Games button is a new one for the app. It allows the user to go directly to the list of recorded games to choose another game to review. This required a couple of steps previously, and the steps were not as obvious as tapping an appropriately labeled button. The Review button is as before. It brings up the complete list of pitchers for which stats were kept in the game. The Done button is to make a new choice to either resume a game, start to record pitches for a new game, or review previous game results (which is what is already being done). Displaying the team name under the pitcher’s name when reviewing a game is also new. The screen below shows the list of pitchers with recorded stats for a certain game played last July. Note that the toolbar for this screen also has a Games button, making it easy for you to choose a different game if you decided to do so at this point for some reason. The Cancel button will take you back to whatever screen led to the currently showing one if you want to do that directly. 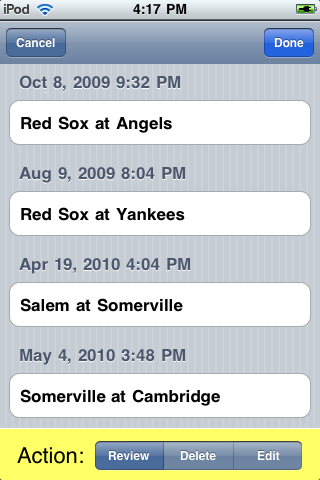 The screen below shows an example of a list of games for which pitch results have been recorded. The Cancel and Done buttons have the expected result. The new feature is the addition of an option in the control at the bottom to Edit a game. Select Edit and then tap on a game in order to edit the names of one or both of the teams in that contest. All of the new features were requested by users. I think having an easier and more direct and obvious way to navigate from game to game when reviewing pitching performances previously recorded is by far the most important improvement. It was the app’s rather awkward navigation between games and pitchers that caused it to receive a couple of “Great app except for…” reviews. I’m hoping those reviewers will find it in their hearts to review OnScreen Pitch Count again after using this updated version and to give it that extra star in the rating. In any case, I have the satisfaction of knowing I’ve made a good app even better. If you don’t already have it, go check it out on the iTunes App Store. This entry was posted on Monday, June 14th, 2010 at 7:50 pm	and is filed under iPhone Development. You can follow any responses to this entry through the RSS 2.0 feed. Responses are currently closed, but you can trackback from your own site.